Do we have any members in Québec/Canada? A French speaking lady living in Montreal wrote to me. She handraised a baby pigeon who bonded with her, but now as a juvenile clearly shows signs of loneliness, staring for hours in the mirror and cooing sadly. 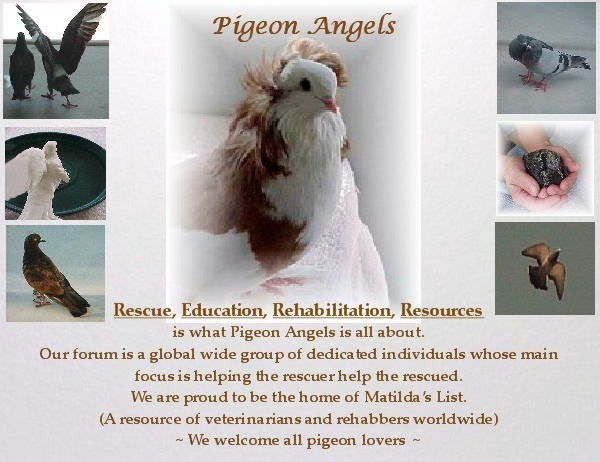 She contacted a few rescue centers but when she says it is about a pigeon, she is just laughed at. Is there anybody in her area who would like to adopt him and who has other pigeons so he could socialize with them? Appreciate the alert about this little guy. We'll scout around and see what we can do to help. Keeping us safe from the predators that share the sky. Please lead us to safety where we are welcome to stay. Thank you for your nice words. Now that baby season is over, I hope I can be present here a little more. I can't think of anyone on this forum offhand, but have you asked Suz in Montreal? I know that at one stage she had contact with another pigeon lover in Montreal, between them they might have other contacts...or they might know of someone that could provide a companion. have you asked Suz in Montreal? ... or they might know of someone that could provide a companion. Where can I find SUZ????????? Amal has also a cat, she does not want her pigeon to spend his life inside a cage when she is not at home, that is why an adoption would be better.